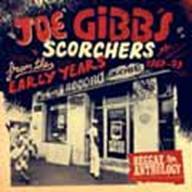 Joe Gibbs: Scorchers From The Early Years 1967-73, available everywhere on April 14, 2009, is an amazing collection of Rocksteady & Reggae hits from the late 60’s and early 70’s, that helped break reggae internationally. This essential jam packed 2 CD anthology, produced mainly by Lee Ã¢â‚¬ËœScratch’ Perry & Niney The Observer for Joe Gibbs, features the genre’s most influential icons and marks a momentous time in musical history. This 17 North Parade release from the Reggae Anthology series contains many special edits only available on this album. Crucial hits from the Rocksteady period can be seen on Disc One (1967-69). Highlights include Roy Shirley’s “Hold Them”, considered by many as the first ever song for the genre, the international chart topper “You’re Gonna Need Me”, a Barbara Lynn cover sung by Errol Dunkley at only 13 years old and mega scorcher “The Upsetter/Upsetter Version” by the musical mastermind Lee Perry & Deejay pioneer Dennis Alcapone. Disc Two (1969-73) begins with the early reggae hits including “Love of The Common People” by singer Nicky Thomas which “practically defines the term pop reggaeÃ¢â‚¬Â¦with its infectious island rhythm and thick string arrangement,” according to All Music Guide. The Joe Gibbs set then transitions into more classic reggae sounds like the “The Gardener” by songstress Julie Anne aka Judy Mowatt, who later became the former Bob Marley backing vocalist with the I-Threes, and also “Maga Dog/Skanky Dog” by the one and only reggae marvel Peter Tosh and deejay Winston Scotland. Both discs encapsulate a musical era from one man’s work, the legendary Joe Gibbs. Nostalgic to many and enlightening to others, no matter the walk of life, Scorchers From The Early Years 1967-73 is a must have for the avid music collector. Producer and entrepreneur Joe Gibbs (born Joel A. Gibson) is known for his epic hit-making studio and seminal releases such as, “Two Sevens Clash” by Culture, “Three Piece Suit” by Trinity, “Someone Loves You Honey” by J.C. Lodge, as well as his innovative African Dub Series. This influential man behind and in front of the boards was a major pioneering force from the late Ã¢â‚¬Ëœ60s, early Ã¢â‚¬Ëœ70s rocksteady/roots era to the early Ã¢â‚¬Ëœ80s dancehall era. He left an indelible mark on reggae music and his hits are staples until today. Gibbs, who passed in 2008, has worked with almost every Jamaican artist of his time including Jacob Miller, The Mighty Diamonds, Gregory Isaacs and Peter Tosh. Launched in 2007 by VP Records, the 17 North Parade imprint pays homage to the historic location of Randy’s Record Mart, the premier recording studio and record shop in Kingston and mecca for Reggae music between the late 60’s and 70’s. 17 North Parade is dedicated to preserving and reintroducing the recordings of the Caribbean’s most influential musical pioneers. Each 17 North Parade release will belong to one of three very distinct catalog series (Reggae Rewind, Selector’s Choice and Reggae Anthology) that define both the contemporary and classic eras in Jamaican music. The Reggae Anthology series captures some of the greatest material from Reggae’s most influential artists, producers and record labels, these very special collections encapsulate the momentous history and achievement of reggae music worldwide. With past titles (released through VP Records) from labels/ artists such as Channel One, Garnett Silk, Yellowman, Ninjaman, and Marcia Griffiths, Reggae Anthology is the crucial Ã¢â‚¬Ëœbest of’ collection for ALL reggae fans.